Guests will be treated to unique dishes matched with exquisite wines. Under Litaker’s guidance, Suffolk Punch offers an ever-evolving menu pairing locally and sustainably sourced seasonal ingredients with scratch-made processes. Our Wine Fest dinner menu, from the Sautéed Prince Edward Island Mussels to Seared Pekin duck breast, showcases Litaker’s unique culinary touch. All come from the renowned Robert Mondavi Winery. Two have earned Wine Spectator and Wine Enthusiast scores of 90 or higher. The Auros Cabernet was crafted by Mondavi Vineyards winemaker Megan Schofield with hand-selected fruit from four revered Napa Valley sub-appellations: Oak Knoll, Oakville, Rutherford, and Stag’s Leap. Each sip is sure to be memorable! 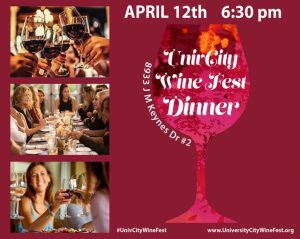 The dinner will take place 6:30-9 pm Friday, April 12, lakeside at University Place at 8933 J.M. Keynes Drive Unit 2. Cost per person is $85. Seating is limited. Click here to buy tickets.